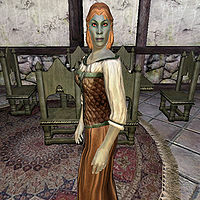 Tolisi Girith is a Dunmer commoner employed as a maid at the Riverview in Cheydinhal. Both she and the charwoman there, Tanasa Arano, carries a dark secret: Both are undercover Mythic Dawn agents and will attack you on sight after you have completed the Dagon Shrine quest. Working under Riverview's righteous owner, the arrogant Voranil, is both hard, underpaid and time-consuming; Tolisi gets up every day at 6am and starts her work on the ground floor at Riverview, only interrupted by an occasional talk with some of the other inhabitants of the house. She keeps working for eighteen hours straight, until finally taking a seat for a very late dinner at midnight. At 2am, she heads down into the basement for four hours of sleep. Even on Loredas, which is the big party night at Riverview, Tolisi will still have to wait for her dinner until all the guests have left at midnight. Sundas, however, is her day off and at 9am, she will exit Riverview and spend the day at Newlands Lodge together with Tanasa, just relaxing and conversing with the regulars there. As neither of them are in any hurry to get back to their jobs, they'll stay at the bar until 11pm, where they will head back to Riverview and their daily routine. Her attire is of middle-class standard: a quilted doublet, a pair of tan linens, and cowhide shoes. She carries around her key to Riverview and a small amount of gold. Her bed is located in the basement. On a desk next to her pillow, there is a clue indicating her connection to the Mythic Dawn cult: the conjuration skill book Mythic Dawn Commentaries 1. Tolisi also knows the standard Mythic Dawn Armor and Mace spell.